I really began to love cooking around the time I graduated from college when I moved into a "fancy grown-up" apartment with a spacious kitchen - the apartment complex had a security gate and everything! My previous apartment was pretty much exactly what you'd expect from a crappy college apartment, so I really felt like I was living the good life. My roommate was a guy I'd been friends with since my freshman year of college, and through him and his friends, I eventually met Joey (another story for another day). So all in all, it was a great time in my life. That winter, I attended several holiday parties: a cocktail party with friends, my work party, family parties, random Friday night gatherings, etc. And through them all, I became quite the creature of habit. I brought a cold veggie pizza appetizer, and peppermint bark. 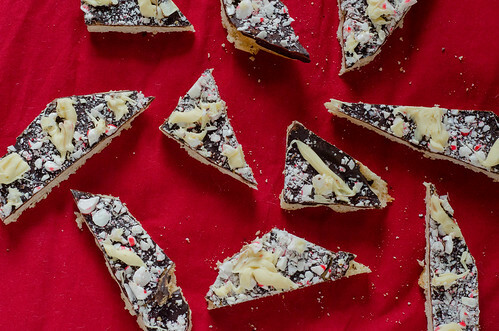 While peppermint bark is a pretty standard holiday offering, I felt like mine was super special - my "secret" was using half peppermints and half spearmints - fancy! As Caroline and Smith helped me pat out the dough, crush the mints, and drizzle the chocolate, I thought about how much things have changed in what's really a short amount of time. Back then, if you'd told me that I'd have FOUR kids, I would have laughed my young and wrinkle-free little head off. But life's full of surprises, and just like peppermint bark, you adapt and evolve. And in this case, I couldn't be happier to do just that. Preheat oven to 350°F. Spray 13 x 9 x 2-inch metal baking pan with nonstick spray, and line the bottom of the pan with a long strip of parchment paper. Leave an overhang on both short sides of the pan. Whisk flour and salt in medium bowl and set aside. Using an electric mixer fitted with the paddle attachment, beat the butter in large bowl until creamy, about 2 minutes. Gradually beat in sugar, and continue beating until the mixture is light and fluffy, about 3 minutes. Beat in vanilla, then egg yolk. Gradually add flour mixture, beating on low speed just until it's combined. Drop the dough by tablespoonfuls into prepared baking pan, spacing evenly. Using moistened fingertips, press dough to form even layer over bottom of pan, then pierce dough all over with a fork. Bake the cookie base until it's light golden brown, slightly puffed, and the edges begin to come away from sides of pan, about 30 minutes. Remove from the oven and place the pan on a cooling rack. iImmediately sprinkle the chopped chocolate over the cookie base, and let stand until the chocolate softens, about 3 minutes. Using a small offset spatula, spread the chocolate over the top of the cookie in a thin, even layer. Immediately sprinkle the chopped peppermint candies on top. Stir white chocolate in medium metal bowl set over saucepan of simmering water until it is melted and smooth. Remove from the heat, and using a fork, drizzle and drop the white chocolate over the cookies. Alternatively, you can spoon the melted white chocolate into a pastry bag, cut a small hole at the tip, and drizzle it over the mints. Chill until white chocolate is set, at least 30 minutes. Using the paper overhang as an aid, lift the cookie from pan and transfer to a cutting board. Use a large knife to cut the cookie into irregular pieces. Nothing like having your own kitchen to get you excited about cooking! I don't really have standbys like this...I just kind of fly by the seat of my pants every time to every party. Which makes it all the more stressful. I just need to pick something and stick to it! This bark looks GOOD. Mmm these look lovely! I love bark on its own and can only imagine how fabulous it is on cookies! !